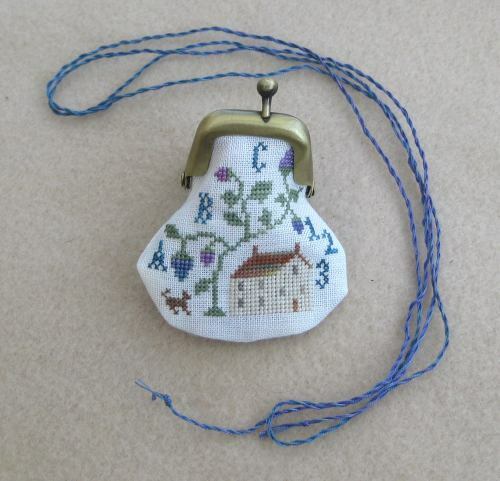 The stitching of this thimble purse by Brenda Gervais itself didn’t take long to do, even though I had added my own design for the reverse side. I expected the assembly to be tricky, however, as this purse is only about two and a half inches wide when it is finished. 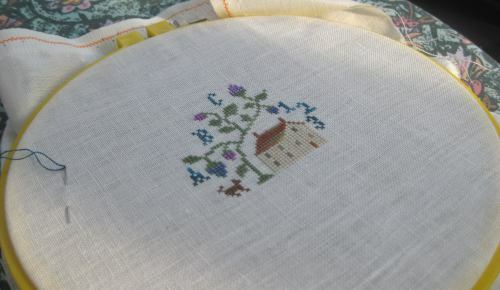 That might sound strange, as I design much smaller things for doll’s houses for my doll’s house needlepoint kit website – but when I’m designing something from scratch, I know it’s going to work!! With other people’s designs, I have to have faith that it is going to work!! This design, fortunately, was easy to put together. 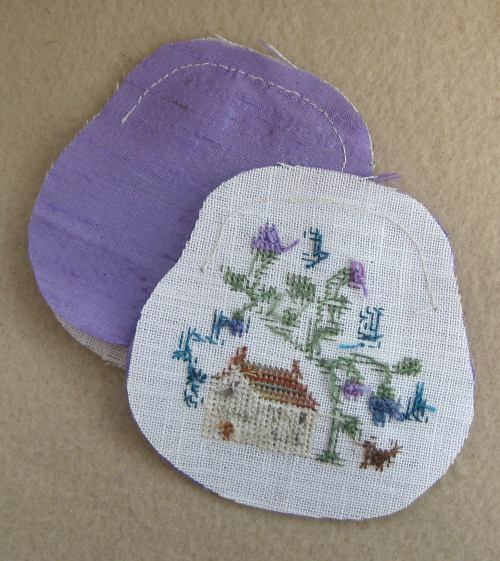 I first cut out the stitching of the front and back pieces using the template provided, and two lining pieces from lilac Dupion silk, and marked with a small dot where the first line of stitching up of the seams would end. 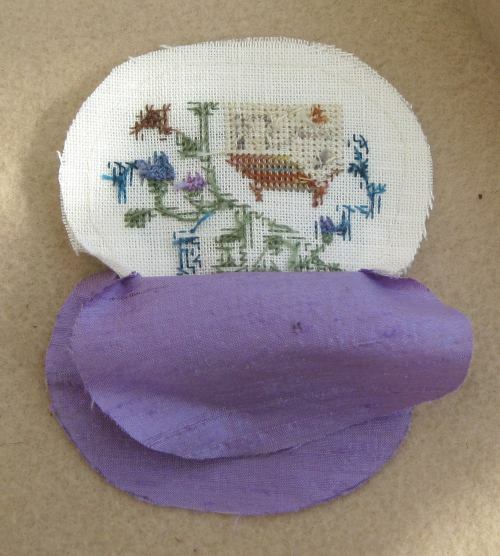 Then I put a front and lining piece, and a back and lining piece together, and stitched round the top edges to the dots. Putting the two stitched pieces front sides facing, and the two lining pieces front sides facing, I stitched by hand (instructions said to use a machine, but I couldn’t be bothered to get mine out and set it up for such a small bit of sewing!) round the lower edges, leaving a gap in the lining pair to allow for turning the piece through. The lining gap sewn up, and the piece turned through, I then had to tackle fixing the stitching to the tiny purse frame. This is a good quality metal frame in a kind of burnished gold, about one and a quarter inches wide, included with the chart pack. I put glue in the groove of the frame, one side at a time, and slid the fabric into the groove, making sure it was straight. I did the back first, in case I made a mess of it! 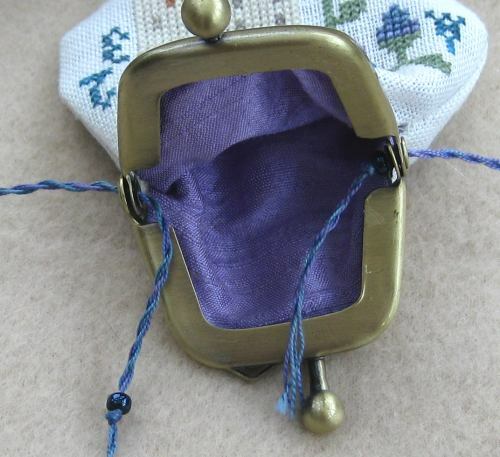 One side of the frame has a kind of loop on it for fixing a strap, so this side has to go to the back of the purse. When I had glued the front piece on to the frame as well (which actually was quite easy), I made a cord out of some of the leftover thread. 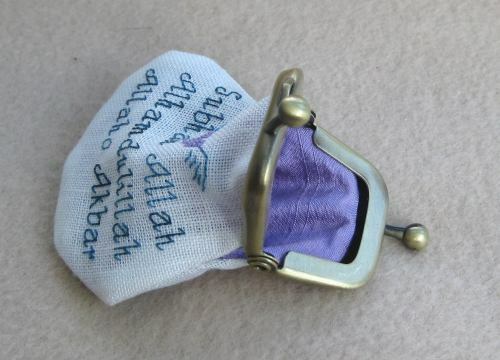 I decided not to use the loop on the frame, as then the purse wouldn’t hang straight when I was wearing it (like the photo on the front of the packet demonstrates), as I’m a bit obsessive about things being symmetrical. So, to get around that, I decided to fix the cord through the joints of the hinges on either side of the purse. So that the cord wouldn’t slip out, I threaded it through two size 6 beads, one on each inside edge of the hinges, so that they acted like washers inside the bag itself. I put fabric glue on the knots to make them secure, then trimmed the cord. The purse, when finished, looks like this. At first, when I tried to wear it, I had a slight problem in that the frame is heavier than the fabric part, so as I had attached the cord in the way that I did, it allowed the purse to flip over and hang upside down, so I got around that by finding a moss agate pebble that I like, and keeping that inside the purse to weigh it down a bit!! 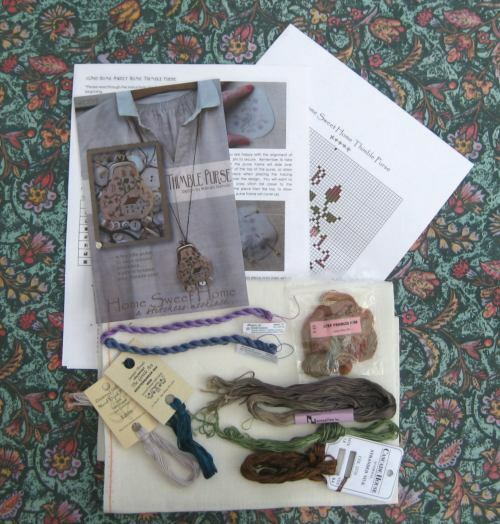 I decided not to add buttons along the bottom edge of the purse, like the photo on the front of the chart pack shows, as I felt it is ‘finished’ enough as it is. The back of the bag looks like this. 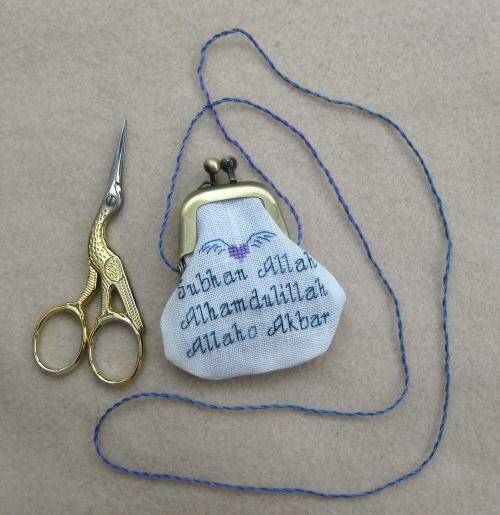 The bag works brilliantly for what I intended it to – I can keep little pieces of paper in it with my wasifas (Islamic mantras) written on them, and wearing the bag close to my heart serves to remind me to think of what the wasifas mean throughout the day. 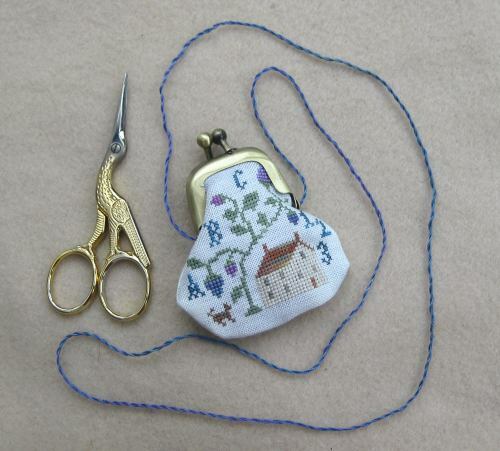 So, it’s a very lovely thimble purse which will probably never have a thimble kept in it, but I like it just the same! I decided to use shades of teal and purple for the flowers and vine part of the design rather than the recommended brown shades, as I wear those colours a lot, and brown shades don’t suit me. The design itself was very quick and simple to do. 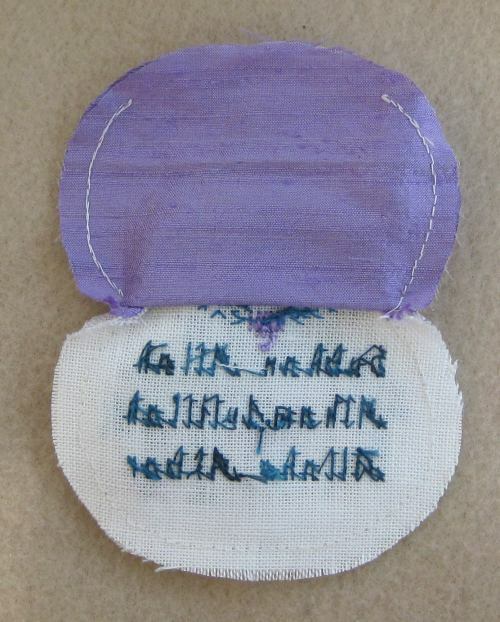 I stitched the design on 40 count linen, over two threads. 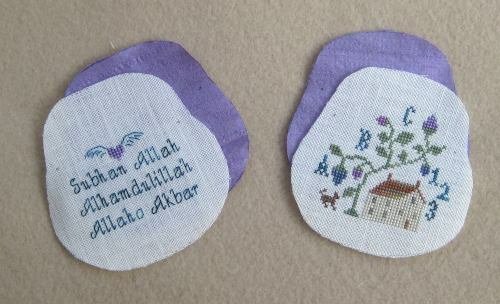 I left off a couple of the letters from the chart, as I felt they might get ‘lost’ in the seams, so I only stitched what would definitely show. 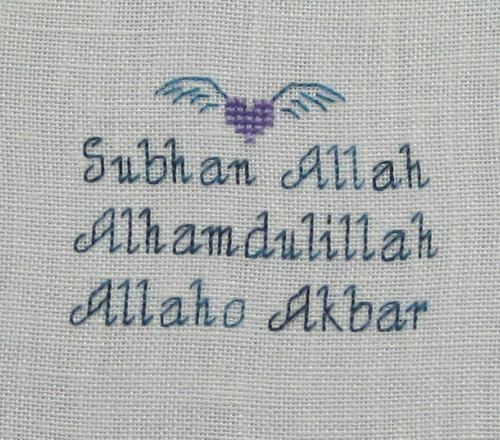 The three phrases mean ‘The Purity of God’, ‘All praise be to God’, and ‘God is greater than all things’.